Start Running Free ! New ! 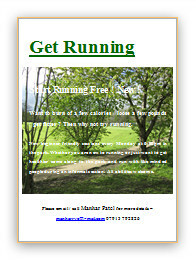 Want to burn of a few calories OR loose a few pounds Or just get fitter ? Then why not try running. New beginner friendly sessions every Monday at 6:00pm in the park. Whether you are new to running or just want to get healthier come along to the park and run with like minded people during an informal session.